There are two clear aspects to Jeep entry guards and grab handles. The first is safety, the second is appearance. Of course, safety is the primary concern, and both accessories contribute to that. Let’s look at the details of each, and what types are available. One of the biggest perks of owning a Jeep is driving around without the doors in the summer, both on- and off-road. While seatbelts can help you feel secure, something to hold on to can be necessary, especially on rough or slick terrain. This not only keeps passengers inside the vehicle, but it keeps them from sliding into objects and each other, and helps them feel more stable and balanced. Grab handles typically mount in a variety of ways, and there are several types to choose form. Bar style grab handles often mount to either roll bars or to existing points in your Jeep. For example, Xbrite offers front and rear grab bar sets that mount directly to OEM holes in the 2007-2017 JK models with no drilling required. For other models, you’ll either have to drill holes or otherwise mount them. Most grab bars are either made of alloys or steel or treated so they won’t rust, even in damp climates or if you take your Jeep into the water. Don’t want to drill? The most common type of grab handle is the nylon type that typically come with two or three straps. You can mount these anywhere you can wrap the straps, so to the top of the roll bar or the side. Because you can move them at will, these are also more versatile than a grab bar. Straps are also less expensive, and because they’re not permanent, you can move them depending on the number of passengers in your Jeep and where they’re sitting. They can be removed and washed separately or simply moved around. Paracord handles are another option, and they’re made by several companies in different configurations and colors. They also use straps to mount, similar to the nylon variety. Paracord is tough, something the military uses for a variety of purposes. When woven together it’s nearly indestructible and can hold an amazing amount of weight. Also, there’re a variety of color choices allowing you to customize the grab handles according to your paint and upholstery. They’re also easy to clean and can be removed or relocated as needed. Finally, there’s another style of handle that mounts to the rear of your front seat headrest. This gives rear seat passengers another place to hang on and gives your Jeep a unique look. These typically mount using your headrest posts and are easy to add or remove as needed. These grab handles are made of nylon and are extremely sturdy. Many have rubber grips for additional passenger comfort. The point is that grab handles add an element of safety to your Jeep, especially for off-road use, but they also enhance the appearance, making it look like a true four-wheel drive machine. One common issue with Jeeps is the entry panel where you step into the Jeep develops scratches over time. It can also get slick in the winter months contributing to the risk of slips and falls. The most common solution is entry guards. Mopar now offers stock entry guards for your Jeep. You can even get them added at the time you purchase your vehicle. Their advantage is you don’t have to worry about fit and finish. They fit exactly as they should and are easily installed. Aftermarket entry guards are often just as good as or better than their OEM counterparts. However, it does pay to be cautious. There are inexpensive imitations out there that don’t fit well and do a poor job of protecting your finish. When it comes down to it, entry guards are made of two materials: plastic and rubber, whether they’re stock or aftermarket. Plastic entry guards are often rigid, but feature tread foot grips for sure-footedness. This rigidity also offers great protection for your Jeep as well, as it typically won’t ding or crack except under great strain. However, if you live in a cold climate, you might want to consider other alternatives, as extreme cold can make plastic brittle and susceptible to cracking and breaking. Rubber is another alternative for entry guards, and in some instances, it’s better than plastic. It’s more flexible, so if it takes a direct hit, it might be more likely to flex, allowing the finish underneath to suffer damage. However, for the most part, it’s tough enough for its location. That flexibility allows rubber to endure temperature extremes, and it does offer good anti-slip when you’re trying to get in and out. Rubber entry guards are usually a little more expensive than their plastic counterparts. 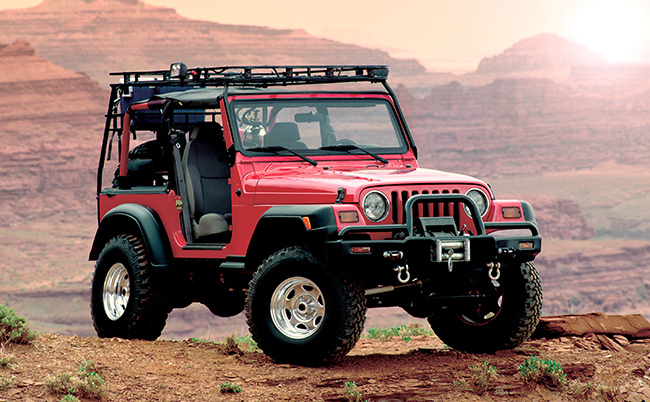 Jeep entry guards and grab handles are both great accessories for your Jeep and many would call them necessities. This guide can help you find the ones that are right for you. If you have any questions on buying tires for Jeep, give us a call at 866-961-8668 or shop for tires today.